Galaxy I offers you an experience of a lifetime, seeing the Great Barrier they way you want to, at your pace, in luxurious surroundings. Stop on that deserted coral cay for an hour, or the whole afternoon and enjoy a spectacular sunset all to yourselves. Dive some of the greatest sites on the planet, swim with Minke whales and fish for the iconic species that inhabit the waters surrounding the Great Barrier Reef. The Galaxy I offers you a complete experience, take her out for the day, the weekend or the week. Go fishing, snorkelling, diving, cruising, or do the lot. Keep her in mind for that special corporate function, sales incentive or product launch, the possibilities are endless. Call us today to arrange your trip of a lifetime. 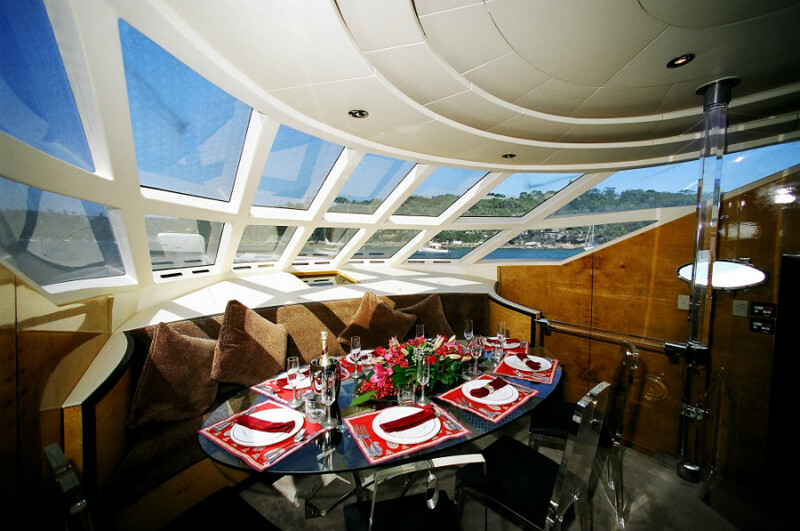 Galaxy I is designed around 3 spacious decks allowing guests to mingle as a group or to find their own space. The upper deck of Galaxy I is perfect for relaxing on a sun lounge in the balmy climate of the Tropical North. The forward deck is ideal as a sunset venue complete with canapés and pre dinner drinks, while the saloon deck is a perfect example of why alfresco dining is the preferred dining option in this area of Australia. Dining aboard Galaxy I is an experience in itself. 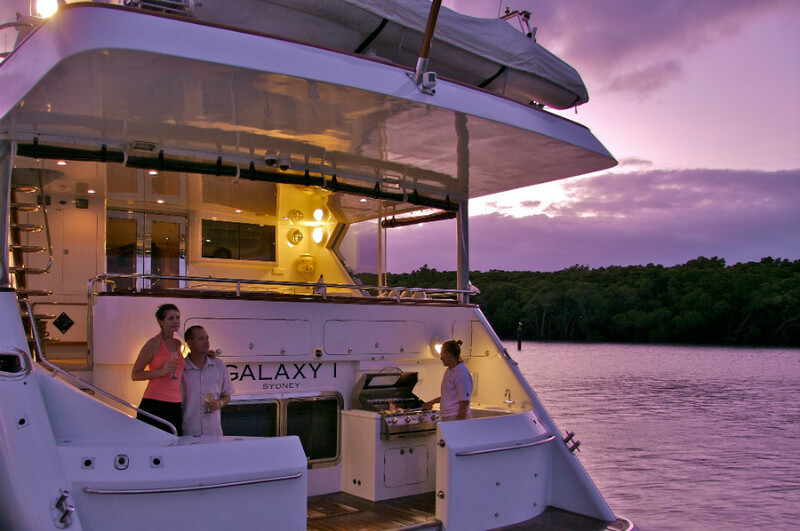 With two designated dining areas, and casual seating on both the forward and upper decks, Galaxy I is perfect for revelling in the climate that makes this area one of the most desirable to visit in all of Australia. Galaxy I’s on board chef takes full advantage of the abundance of local natural produce, whilst ensuring that every palate is catered to. Everything from formal dinners, to casual BBQs can be offered for consideration. Comfortably sleeping 6 passengers, the staterooms of Galaxy I continue the attention to detail seen throughout the entire vessel. The master stateroom boasts a king size bed, with marble ensuite. The stateroom also has it’s own TV and DVD player and stereo system. Two guest staterooms feature twin bedding and own ensuites, again with their own TV and DVD player. For those seeking a little adventure, then Galaxy I’s wave runner will supply endless hours of fun. 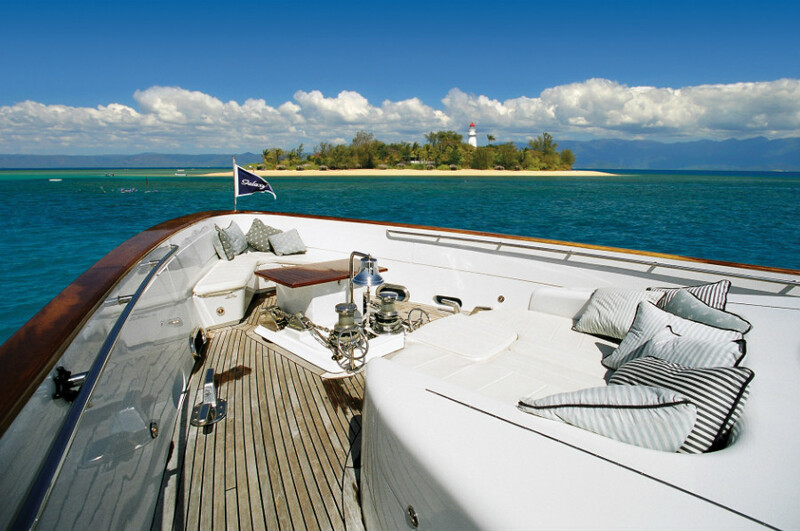 The vessel also has a full range of snorkelling and fishing equipment as well as several paddle skis. SCUBA diving can be offered to guests on a request basis. Galaxy I is also serviced by a 60hp tender to ensure access to all areas.